I was hesitant to start reading this book because I knew that a Christian Fiction was exactly NOT what I was in the mood for, but I had a deadline to make, and so here I was, forcing myself through the book. Despite that however, I'm pretty sure my thoughts on the plot would have been exactly the same even if I'd been in the mood. After all, a good book will never fail to knock your socks off. As I started reading this, I was surprised that the story was turning out to be better than expected. The first chapter begins with Ian, a U.S. Marshall, chasing after an outlaw, and I don't know how anyone could find that boring, especially when he is the male lead in the novel (an officer, ooh la la). Then out of nowhere came this mysterious light than bounces around and causes the Marshall's horse to throw him through a barn wall. It didn't seem very realistic; the entire time I was thinking that it was someone playing a trick or something caused by nature, and then it turns out that it's more akin to an angel than anything. I'm a devout Christian and all, but I'm pretty sure things like that stopped happening a long time ago, as in waaay before America was founded. I'm certainly not against the whole idea of an angel being in town, but 1) it takes the Christian and Fiction parts of Christian Fiction just a bit too far, and 2) I don't really think an angel would try and scare a newly married couple away from the Bolton's house. Another problem I had with this book was the romance: it literally came out of nowhere! Lyric spent every moment since she met Ian thinking that he was an outlaw, and wanting to turn him in for bounty. For Pete's sake, the entire time she was "healing" him she was wondering how much bounty she would get for turning him in to the Sheriff, even though she knew that turning Ian in would result in him being hanged. It's like, I know you want to move away, but do you have to kill a man to get what you want? I can definitely say that throughout the whole novel, I preferred Ian's character to Lyric's. But back to the point, so there Lyric was hoping Ian would make her a fortune, and then all of a sudden the two are holding hands and kissing?? Not only that, but there's no doubt, and hesitation, and no talking??! And we, the readers, are just supposed to accept that? I know I'm from a different time period, but I'm pretty sure that even back then love didn't happen that quickly/easily. 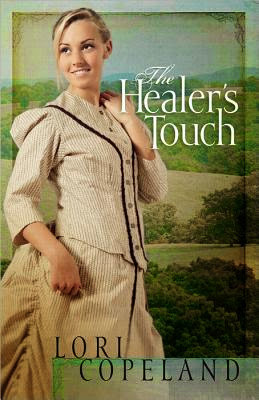 Considering that Christian Fiction novels are mainly about the romance, and that the romance in this book was completely unrealistic, 'The Healer's Touch' lost a few stars pretty early in the book. Being a nice person - okay, I may be exaggerating just a bit - I decided to give this book one last try even though the romance, which is my favorite part of any novel, was terrible. I figured that even if the love didn't real me in, the plot around the end should. After all, even though Lyric doesn't want Ian to hang anymore, he has no way to prove his identity, and the Sheriff and the rest of the town are dying to see some dying. Unfortunately, that was a flop too. Ian's plan worked out perfectly, and there were pretty much no hitches, not counting a brief dip in the relationship between Ian and Lyric, though that was fixed in quite a quick jiffy. Honestly this book would have gotten at least half another star if Lyric had taken longer to trust him the second time. I can't really blame her though, considering she's never really been around boys. Yet that begs the question of how Lyric knew she loved Ian (in all of the 2 seconds she thought about it). To summarize, 'The Healer's Touch' is about a young woman trying to make her life her own after forced into staying home all the time due to nasty gossip, and after meeting Ian, finds out that maybe her future may end up brighter than she had expected. Though the plot seemed solid at first, the story-line seems utterly forgettable, and the main character isn't someone I really understood. The romance was faster than whirlwind, and unlike most Christian Fictions, everyone already seemed to put their faith in God. I don't think I'd ever recommend this to anyone. Book Synopsis: Lori Copeland, beloved author of more than 100 books, brings a new adventure to life in her latest novel.